Data loss is a very common issue and almost every phone user, including the users of Xiaomi device, has had this experience more than once. But fear not, there is plenty of Xiaomi data recovery software available in the market that can set things back in order for you. 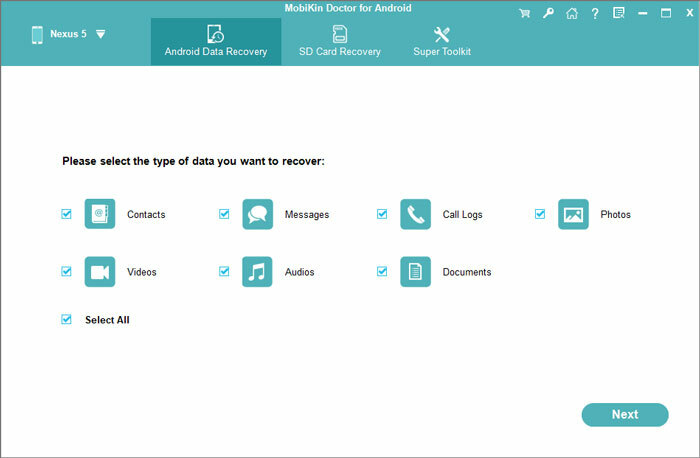 MobiKin Doctor for Android is a professional Android data recovery software that can restore all your mistakenly or accidentally deleted data to their original formats in just simple clicks. No matter the data you lost is contact, text messages, call logs or other types of files, it can help you get back the data without any hassle. And what's more important, this powerful software is fully compatible with all Android devices, and Xiaomi is included. This Xiaomi data recovery software is easy to use - only 3 steps can you complete the recovery process: connect > scan & preview > recover. And except for the recovery function, it also equips another feature - backup. It can scan both your deleted and existing data and easily transfer them to your computer for a future backup. This program provides two versions for you - Windows and Mac. So you can choose the one you need and then start recovering your phone data. This recovery software lets you restore data from your Android based Xiaomi phone just in three easy steps. The best part is you can experience all its features for free. It can rescue your crucial data of different types even if you lost them due to a wrong deletion, virus attack, rooting, improper handling, SD card issue and more. With this smart Xiaomi data recovery software, you can retrieve deleted or lost data like contacts, photos, text messages, audios, videos, documents, and more from both your internal phone memory as well as the external SD card. The Dr.fone - Recover (Android Data Recovery) enables you to recover data from Xiaomi phones under any circumstance, including a damaged screen, flashing of the ROM, corrupted SD card or anything else. It can restore back different types of your lost, erased or deleted data in minutes, including WhatsApp history, contacts, call history, media files or any other documents. FoneDog is one of the best software if you have lost all your phone data with no backup. No matter your phone is broken, frozen or how you lost your important files exactly, this 100% secure tool can recover data from Xiaomi with or without root. It will offer a quick preview and restoration of all your deleted contacts, messages, call histories, media files and so on. Last but not least, iCare Data Recovery is another next level solution when you want to restore your lost Xiaomi data in an effortless way. No matter your phone data is lost due to RAW, unexpected power outage, hard disk crash, partition error, factory reset, format issue, virus attack or any other damage or accidental deletes, iCare can restore back all your crucial data in just 3 easy steps. Now that you already know five different Xiaomi data recovery software, it's time to quickly review how each one performs in real time. Learning the good and the bad sides of each one will help you get a comparison in terms of their data restoration and backup performance. Remember, some features are unique to some particular data recovery software only. Free and purchase version available. You need to root your Android phone before recovering contacts, text messages and call logs. The supported file types are limited. All features are not available in the free version of the software. Allow selective retrieval and easy backup. May not be compatible with many of the latest Android devices. Offers basic and advanced recovery modules like powerful unformat, RAW drive recovery, and more based on different data loss scenarios. Advanced recovery features like Lost Partition Recovery or Deep Scan Recovery are only available with the paid version. It is unpredictable when the data lost issue would happen, so to ensure the safety of your phone data, you'd better back up your wanted files regularly. And if you wish to complete the backup easily and effectively, you are recommended to use the MobiKin Assistant for Android which enables you to backup all your Android data to computer with one simple click. With the world moving more digitized every single day, today's generation is keen on making their phones a leverage platform for everything important. That is to say, you will use your Xiaomi phone more and more frequently and save more important files in the device. And to avoid losing the significant data, you need to prepare a professional Xiaomi data recovery software and the above-mentioned software can be your priority selection. How to Recover Data after Factory Reset Android Phone?